up their game more quickly. For the last 2 years, as I did trainings on advocacy campaign innovation across the U.S., Canada, the U.K. and Australia, I kept hearing the same questions pop up on emerging strategies and tactics. “How can we set up distributed organizing…. or P2P texting…. or A/B testing…. in our org?” And though many of the campaigners and organizers asking these questions had already gotten really good at one of these innovations, they had little experience with the others and were curious to try. To my frustration, since I never had more than one day with each group, these questions remained unanswered. This clear thirst for strategy-sharing among the people I met from some of the world’s most well-known and accomplished advocacy organizations is echoed by Mobilisation Lab’s recent survey of emerging campaigner needs, which underlines global sector gaps including innovation-mapping, tools and capacity-building events and resources. This challenge led me and an awesome team of volunteer bottom-liners to start building “Blueprints for Change”, a collaborative project that compiles knowledge and field-experience from a global network of campaign innovators and then makes this knowledge accessible to as many progressive organizers and campaigners as possible to help everyone “up their game” more quickly. Our approach to this is to collectively create ‘how-to’ guides on campaigning practices that are emergent (new and not yet fully documented), in demand by campaigning groups and field-proven (have been applied with success in prior campaigns). 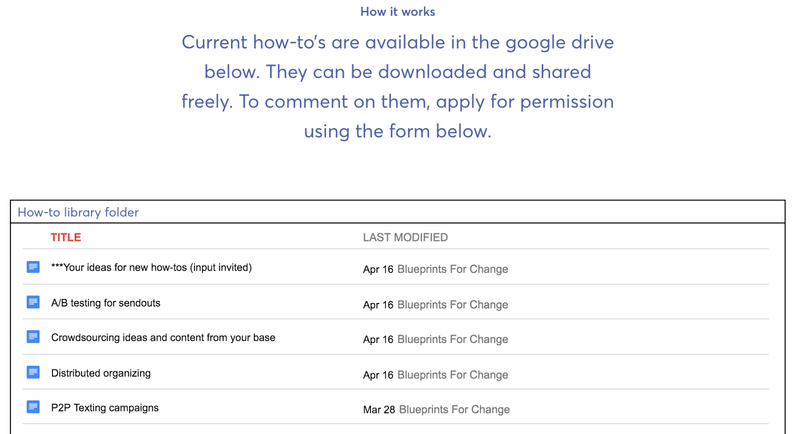 These guides live as google docs and are constantly being updated and improved with input from the progressive campaigning community. So far, we have been able to put together guides on distributed organizing, P2P texting, A/B testing for sendouts and crowdsourcing ideas and content from your base. But this is just the beginning! We are actively calling out for new how-to ideas and give priority to requests that come to us directly from campaigners/organizers. You can drop in some requests of your own into this crowdsourced list we have going here. 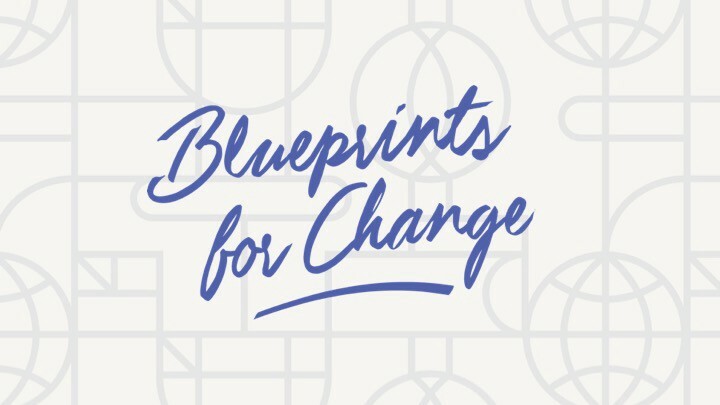 Blueprints for Change is a collaborative project that runs on the contributed time and energy of some kickass people and we want everyone who contributes to feel respected and empowered in the process. In our own structure and practices, we hope to reflect the world we want to see. Equity, Empowerment, Transparency and Collaboration guide us as founding principles and though we still have a lot of work to do to live up to these standards, we are committed to keep striving. To put transparency into practice, we have tried to lay bare all of the thinking and process behind the project in this doc for you all to see. At its heart, this project is rooted in collaborative and consultative process in relationship with a larger community of campaigners/organizers. We try to hear what problems people are trying to solve, draw ideas and insights from those who have direct experience with deploying the tactics/strategies and submit our drafts for review by others before they are promoted. 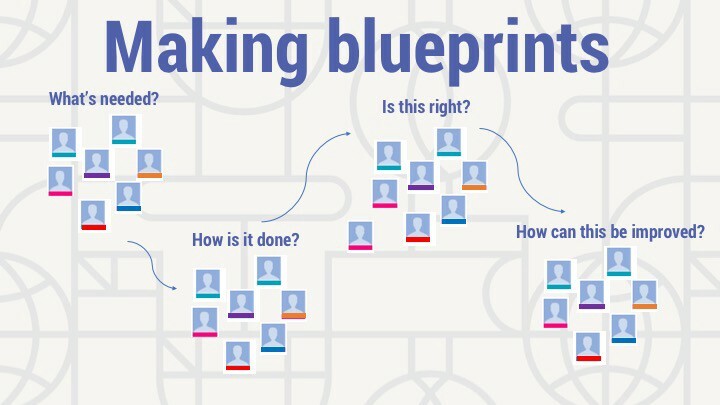 If you’re a progressive campaigner/organizer, we’d love to draw you into using/contributing to Blueprints for Change. 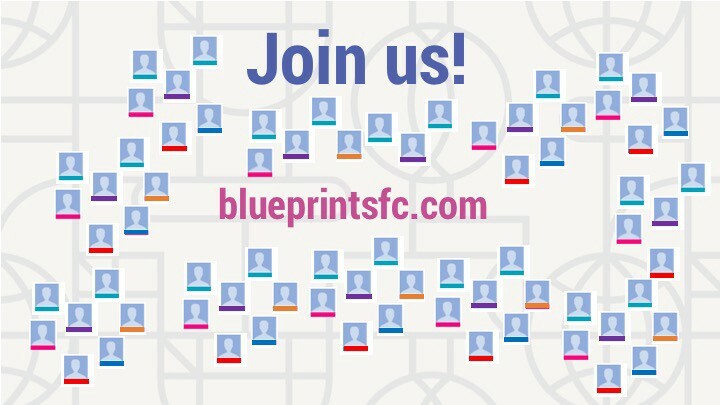 To join us, start by signing up to our internal newsletter here and then go and help yourself to the blueprints and spread them around wherever you think they can help. And finally, a big and heartfelt shout-out to our early crew of bottom-liners and advisors — Meredith Horowski, Tasha Adams and Jon Lloyd, Tania Mejia, Jacqui Howard, Kunoor Ojha, Nicole Regalado and Amara Possian — and conversation partners — Jason Mogus, Jodie Tonita, Jacqui Howard, Michael Silberman — who put their trust in this project well before it became a thing! !